I found the excerpt from this book really interesting because it displayed information about people in the biking world in a way that was both humorous but easy to understand. 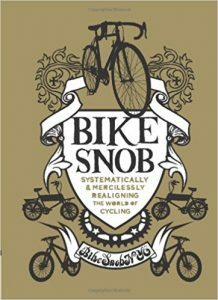 The author went through and listed different types of cyclists such as “the roadie” and “the mountain biker”. The author then went on to explain what the cyclist was like and finally their compatibility with other types of cyclists listed. This exert helped me figure out what I wanted to do for presentation 3 as I started to think about different groups in Australia on both a national scale but also in terms of suburbs and how they interact with one another as well as the reasoning behind this.